a. Measure and attach 2 brackets onto wall. make sure the hose will reach the shower pipe from your mounting location. Included anchors are for tile surface. Be sure to use a masonry or ceramic drill bit. Fiberglass enclosures will need a different "toggle style" adapter to attach the brackets. Be sure to silicone around the bracket if attaching to fiberglass. b. Notch the side of the unit where the hose exits. Depending on the material of the shower panel construction, different tools can be used for this purpose. c. Using an assistant, attach the shower panel to the shower pipe, and hang the panel onto the 2 brackets, making sure it is "locked" into place by pulling downward onto it, and moving side to side to make certain it is affixed onto the brackets. a. 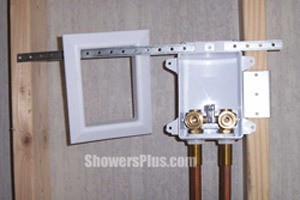 On the back of the shower panel, remove the "T" connector that connect the hot and cold water lines along with the input hose. Shut off the water at the main using a curb key. 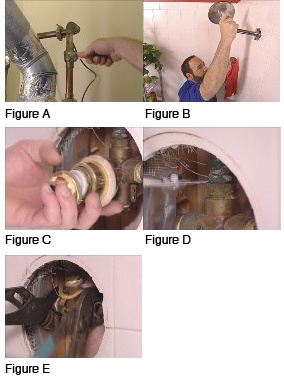 Close the valves at the water heater (figure A). Next, turn off the power to the water heater. Open the hot and cold at the bathroom faucet to relieve the pressure in the lines. Then, open the valve (figure B) to let the remaining water out. Remove the shower arm using slip-joint pliers to loosen it first. Remove any parts you can from the valve body (figure C). 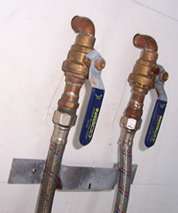 Use a hacksaw to cut the water line where you can leave as much copper pipe as possible above the valve body (figure D), then cut either the hot or cold line. Using slip-joint pliers, unscrew the old valve (figure E) off the male adapter and remove. Install a compression fitting (figure A) to replace the adapter that was just removed from the hot or cold line. 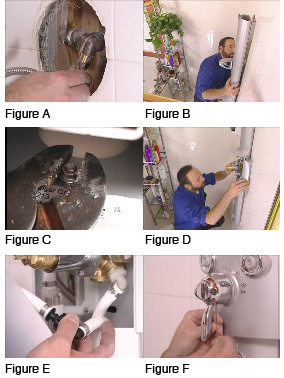 Apply Teflon paste to the threads on the end of the cold and hot water line (figure B). Hand tighten the factory provided female adapters to the threads (figure C), then tighten down with pliers. Before installing the anchors, place a piece of painters tape over the spot where you'll be drilling the hole. This helps prevent damage to the tile. Using your drill with a tile bit, drill the hole into the tile. Apply silicone caulk to the anchor for a good seal. Follow the manufacturers instructions when installing anchors. Place the anchor into the hole, then set the screw. Attach the stainless steel water line to the adapters (figure A) installed earlier, then tighten with pliers. Mount the body shower by lining up the bolts over the keyholes on the back of the unit (figure B). Start with the top and work your way to the bottom. 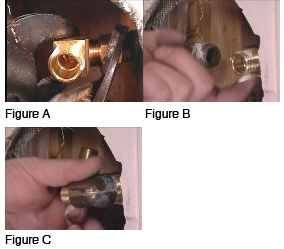 Tighten the nut onto the shower bolt located on the bottom of the body shower (figure C), then tighten with pliers. Install the two side screws using a Phillips screwdriver. Next, install the side panels (figure D). Place the shower arm into the holder, then attach the hose to the male adapter on the unit. Connect the water lines to the female adapter on the back of the cover plate (figure E). Put the cover plate on, then snap on the decorative plates around the jets. Turn on the water at the main, then turn on the water and power to the water heater. Turn on the shower and allow the water to cycle through, then test the temperature to ensure the anti-scald valve is working properly. Finally, install the handle and tighten the setscrew (figure F). a. On the back of the shower panel, remove the "T" connector that connect the hot and cold water lines along with the input hose. Install the hot and cold lines at about 5' height and 4" apart with ball valves pointing downward for easy hose attachment and shower panel connection and removal for service without having to turn the water off to the entire residence. b. attach brackets. Remember to measure carefully! 4. New Construction or Major Remodel (Very Best Way) This install box can be mounted to the left, right, or between studs with the adjustable metal mounts. It can also be flipped upside down for overhead pipes. The inlets on the box can take either 1/2" copper plumbing, or use the 1/2" MIP threads for a Pex interface or other install method. It has tabs that are recessed 1/2" to allow for wallboard and a ratcheting trim piece that will accommodate varying thickness of tile or other surface material, such as fiberglass or natural stone. The outside dimensions of the trim is only 7" high by 6" wide which will easily be hidden by the shower panel when mounted on the wall. This part is only available with purchase of our ShowersPlus.com shower panels. Since this is recessed in the wall cavity, it will allow for easiest placement of our current and future shower panel offerings!